As one of the most dangerous ways to catch a fish, safety is of prime importance when you are casting from the rocks. Away from the beach crowds, a scramble across a rough shoreline to a choice mark on a rocky outcrop overlooking deep water can reward the intrepid angler with rich fish yields – but at a price. As one of the most dangerous types of fishing, rock fishing claims the lives of anglers every year, with victims variously slipping off the wet rocks or being swept into the sea. Its seclusion, while one its attractions, contributes to the danger by hindering attempts at rescue. One factor in rock fishing's renown as a dangerous activity is due to the number of participants who, whether through naivety or foolhardiness, fail to heed the extra level of precaution it demands. Failing to pack the right equipment, wear the appropriate clothing, check weather conditions and tides, and fish in the company of others, can all come at a heavy price. Believing that if you are able to swim you can save yourself if you fall into the water is misguided. The ability of an individual to swim after an accident while rock fishing can be adversely affected by factors such as injuries suffered when being hit by a wave or thrown over rocks, the difficulty of swimming in waves, and the effects of panicking and the cold water. Rock fishing will never be a totally safe activity but by acting responsibly serious accidents can be averted. As rock anglers will need to traverse and maintain casting position on wet, jagged and sometimes seaweed strewn rocks, sensible footwear is essential to prevent any slipping. Shoes should be relatively light and have non-slip soles, with rock plates or cleats offering extra traction. If you do fall into the water then your clothing should aid rather than hinder your rescue. A life jacket or buoyancy vest is necessary to keep you afloat while lightweight clothing, such as shorts and a spray jacket, will not hamper swimming and drag you down. Head protection is also advised as of those anglers that have drowned while rock fishing many first suffered head injuries as a result of tumbling onto the rocks. Other safety equipment it is recommended to take along include a first aid kit, torch, rope, mobile phone and also a buoyant item that can be easily thrown and held onto while in the water. The greatest safety assets of all are other people, whether it’s the friends or family you tell where you are going and at what time you are expected to return, the emergency services on hand to step in if you encounter difficulties, or the fellow anglers that you need at your side while rock fishing. With recent research showing that of those that died while rock fishing one in four were alone at the time of death, rock anglers should fish in a group of at least three and all within sight of one another. If a group member then falls into the water, one person can then stay with the individual while the other alerts the emergency services. If you don’t have any friends that share your enthusiasm for rock fishing then perhaps it’s time to get to know local anglers by joining a local fishing club. This might also offer a better chance of fishing with those with a good knowledge of local conditions and the best and safest marks. If you don’t have local fishing experts at your side then it is essential to first seek local advice about tides and currents. By listening to weather forecasts or calling the weather information line you can learn about local weather, swell and tidal conditions before heading out. With conditions apt to change dramatically in a short space of time, you nevertheless need to be constantly aware of your surroundings. For instance you need to be conscious of rising tides and make sure that you aren’t cut from the shore and stranded on an isolated rock outcrop. 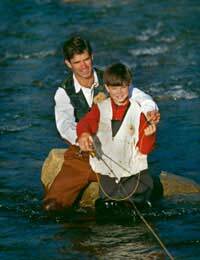 Rock anglers should also have an escape route in mind if they are washed into the water. You swim away from the rocks and look for a safe place to come ashore or stay afloat and wait for help to arrive. In terms of choosing a relatively safe mark, it is firstly wise to choose spots frequented by more experienced anglers. Otherwise you should avoid exposed areas and spend some time observing the conditions over a full swell cycle before deciding to settle. Finally, even with all these safety measures in place, rock anglers should stay alert at all times and never turn their back on the sea. If the waves, weather or swell threaten your mark then don’t tempt fate - leave immediately.